Let's walk together. In the pursuit of global progress, not a single person should be left out or left behind in any corner of the world, from East to West, from South to North. Let's speak together, let our minds come together! Learning from the experiences of our ancestors, let us together create knowledge for all that benefits all. I give the biggest credit of this honour to my movement's Kaalu Kumar, Dhoom Das and Adarsh Kishore from India and Iqbal Masih from Pakistan who made the supreme sacrifice for protecting the freedom and dignity of children. I humbly accept this award on behalf of all such martyrs, my fellow activists across the world and my countrymen. 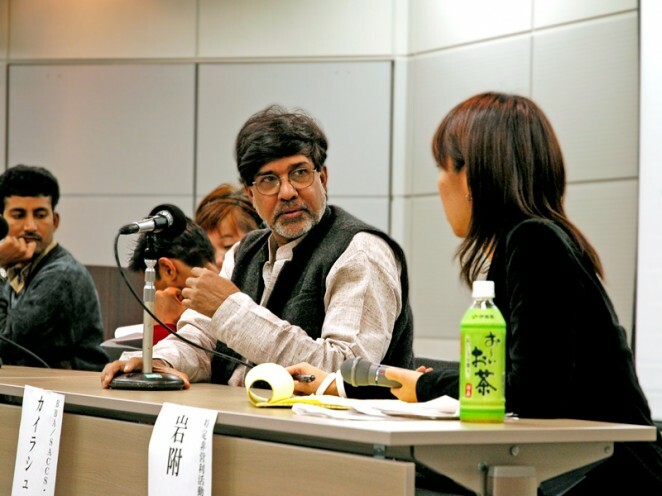 Friends, the Nobel Committee generously invited me to deliver a "lecture." Respectfully, I am unable to do that. I represent here the sound of silence. The cry of innocence. And, the face of invisibility. I have come here to share the voices and dreams of our children, our children, because they are all our children. Twenty years ago, in the foothills of the Himalayas, I met a small, skinny boy. He asked me: "Is the world so poor that it cannot give me a toy and a book, instead of forcing me to take a tool or gun?" I met with a Sudanese child-soldier who was kidnapped by an extremist militia. As his first training, he was forced to kill his friends and family. He asked me: "What is my fault?" Twelve years ago, a child-mother from the streets of Colombia - trafficked, raped, enslaved - asked me this: "I have never had a dream. Can my child have one?" 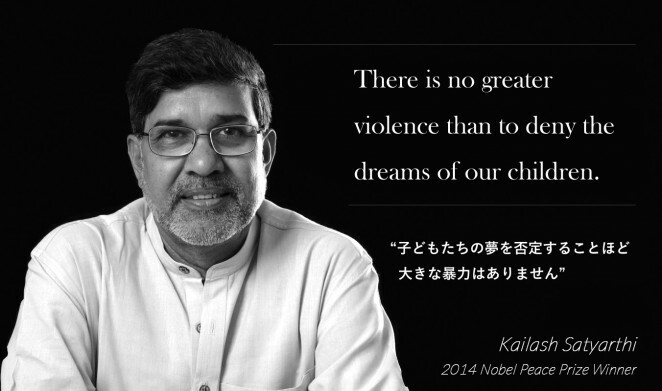 There is no greater violence than to deny the dreams of our children. All the great religions tell us to care for children. Jesus said: "Let the children come to me; do not hinder them, for the kingdom of God belongs to them." The Holy Quran says: "Kill not your children because of poverty." I am privileged to work with many courageous souls who also refuse to accept. We have never given up against any threat and attack, and we will never. Undoubtedly, progress has been made in the last couple of decades. The number of out of school children has been halved. Child mortality and malnutrition has been reduced, and millions of child deaths have been prevented. The number of child labourers in the world has been reduced by a third. Make no mistake, great challenges still remain. Friends, the biggest crisis knocking on the doors of humanity today is intolerance. Solutions are not found only in the deliberations in conferences and prescriptions from a distance. They lie in small groups and local organisations and individuals, who confront the problem every day, even if they remain unrecognised and unknown to the world. You may ask: what can one person do? Let me tell you a story I remember from my childhood: A terrible fire had broken out in the forest. All the animals were running away, including the lion, king of the forest. Suddenly, the lion saw a tiny bird rushing towards the fire. He asked the bird, "what are you doing?" To the lion's surprise, the bird replied "I am on my way to extinguish the fire." He laughed and said, "how can you kill the fire with just one drop of water, in your beak?" The bird was adamant, and said, "But I am doing my bit." But there is one serious disconnect. It is the lack of compassion. Let us inculcate and transform the individuals' compassion into a global movement. Let us globalise compassion. Not passive compassion, but transformative compassion that leads to justice, equality, and freedom. Mahatma Gandhi said, "If we are to teach real peace in this world... we shall have to begin with the children." I humbly add, let us unite the world through the compassion for our children. Whose children are they who stitch footballs, yet have never played with one? They are our children. Whose children are they who mine stones and minerals? They are our children. 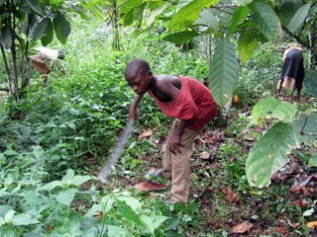 Whose children are they who harvest cocoa, yet do not know the taste of a chocolate? They are all our children. Devli was born into intergenerational debt and bonded labour in India. Sitting in my car immediately after her rescue the eight-year-old girl asked: Why did you not come earlier? Her angry question still shakes me - and has the power to shake the world. Her question is for all of us. Why did we not come earlier? What are we waiting for? How many more Devlis will we allow to go without rescue? How many more girls will be abducted, confined and abused? Children, like Devli across the world are questioning our inaction and watching our actions. We need collective actions with a sense of urgency. Every single minute matters, every single child matters, every single childhood matters. I challenge the passivity and pessimism surrounding our children. I challenge this culture of silence, this culture of neutrality. I, therefore, call upon all the governments, intergovernmental agencies, businesses, faith leaders, the civil society, and each one of us, to put an end to all forms of violence against children. Slavery, trafficking, child marriages, child labour, sexual abuse, and illiteracy have no place in any civilised society. Friends, we can do this. Over fifty years ago, on the first day of my school I met a cobbler boy my age sitting at the school gate, polishing shoes. I asked my teachers these questions: "Why is he working outside? Why is he not coming to school with me?" My teachers had no answer. One day, I gathered the courage to ask the boys' father. He said: "Sir, I have never thought about it. We are just born to work." This made me angry. It still makes me angry. I challenged it then, and I am challenging it today. As a child, I had a vision of tomorrow. That cobbler boy was studying with me in my classroom. Now, that tomorrow has become TODAY. I am TODAY, and you are TODAY. TODAY it is time for every child to have the right to life, the right to freedom, the right to health, the right to education, the right to safety, the right to dignity, the right to equality, and the right to peace. TODAY, beyond the darkness, I see the smiling faces of our children in the blinking stars. TODAY, in every wave of every ocean, I see our children playing and dancing. TODAY, in every plant, tree, and mountain, I see that little cobbler boy sitting with me in the classroom. I want you to see and feel this TODAY inside you. My dear sisters and brothers, may I ask you to close your eyes and put your hand close to your heart for a moment? Can you feel the child inside you? Now, listen to this child. I am sure you can! I call upon you in this room, and all across the world.I call for a march from exploitation to education, from poverty to shared prosperity, a march from slavery to liberty, and a march from violence to peace.